Enter this home and feel the quality of craftsmanship. Built by one of Crestones premier builders, this Lee Mitchell home features one level living, 14 ft. ceilings, oversized windows, placed for mountain views, and maximum solar exposure. Tile floors throughout, sliding doors to back porch with large SW vegas. Large Master Suite with 5 piece bath, custom tile work, glass shower, soaking tub. Walk in closet large enough for all your needs. Plenty of storage space in this home. Kitchen also features a pantry, all stainless high end appliances, with gas cooking stove for the chef in the family. 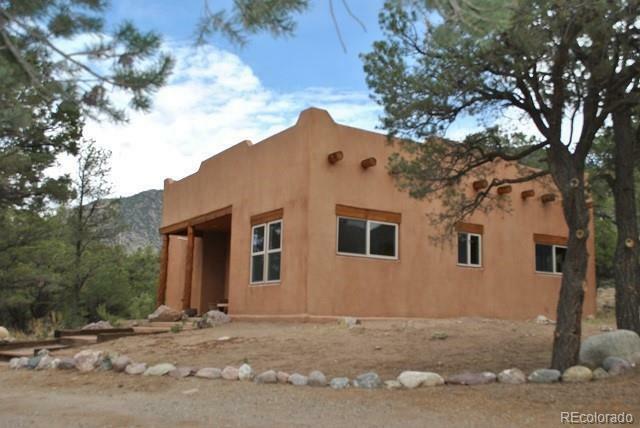 Small breakfast bar, and large dining area looking out on the Sangre De Cristos. Guest bedrooms located on the opposite side of the home from the Master Suite, with their own full bath. Living room has views that will keep you sitting on the couch with your book, wine, tea, or morning coffee. In floor radiant heat, washer, dryer and all appliances included. Put this on your list to view.